Unlock your potential for success, joy and fulfillment. In his first book, Robert White looks at why some people live fulfilled, successful lives, while for others, contentment and real success always seem to be just out of reach. How is it that some people know what they want and go for it, while others flounder and struggle and never seem to discover their real goals and purpose in life? Why are some people able to live extraordinary and joyful lives while, for others, life seems repetitive, flat, a giant yawn, an exercise in high drama or run by fear? Robert White does not pretend to have all the answers. However, after over thirty years founding and/or leading personal and organizational training companies that have graduated over 1,3000,000 participants from high-impact personal and organizational effectiveness seminars, he’s in a good position to help you explore what works – and doesn’t work – in your life. Could Robert be the "interruption" that you need? This book is incredible and has truly changed my life!! 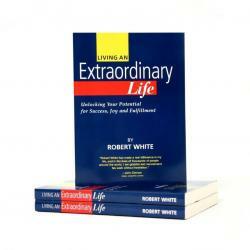 Robert is a man with real life experience and he shares and teaches that experience with passion. I think about and use his wisdom frequently. Highly recommended. Robert's work goes way beyond the rah-rah feel good stuff. It is intelligent and inspiring. This book and his work have made a huge difference in my life.